Forwards Erin Jipping and Raisa Yewah headline a group of five Hope women’s soccer players to receive All-Michigan Intercollegiate Athletic Association (MIAA) Honors. Jipping, a junior from Holland (West Ottawa HS), and Yewah, a senior from East Lansing (Okemos HS), both are First Team All-MIAA selections. Three more members of the Flying Dutch earned All-MIAA Second Team distinction — junior midfielder Lindsey Bieri of Holland (Holland Christian HS), junior goalie Kat Dickson of Grasylake, Ill. (Grayslake Central HS) and junior forward Nora Kirk of Maumee, Ohio (Notre Dame Academy). Jipping and Yewah shared the team lead with 20 points. 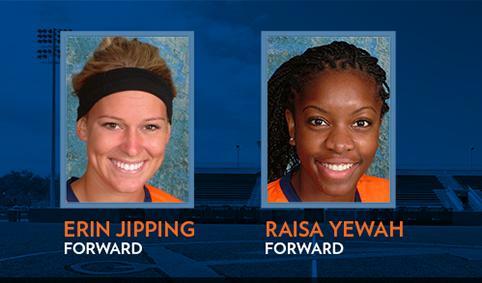 Jipping recorded five goals and team-high 10 assists, while Yewah topped Hope with 10 goals. “Erin’s a tough one. Everyone knows about her speed, and teams try to shut her down,” Hope coach Leigh Sears said. “She was still first in assists. She didn’t score as much as she did last year, but she found other ways to be dangerous. Kirk came in third for the Flying Dutch with six goals and 16 points. Bieri collected three goals and five assists. She tied for fourth on the team with 11 points. Dickson allowed less than one goal per game. She allowed 12 goals in 1,595 minutes of play for a 0.68 goals against average. Six Hope College men's soccer players have been awarded All-Michigan Intercollegiate Athletic Association (MIAA) All-Conference Honors, including four on the first team. The Women’s Chamber Choir and three other vocal ensembles of Hope College will perform on Monday, Nov. 25, at 7:30 p.m. at St. Francis De Sales Catholic Church.